Instead of buying a Christmas tree, I convinced my parents to break from tradition and have an Avocado Christmas. 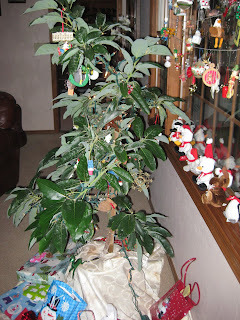 For about $40 we purchased a Bacon Avocado tree from the local nursery and replaced it with a would-be Christmas tree. This potentially saved us a few bucks, and rewarded us with a wonderful avocado tree to plant outside in the spring. Sadly not every ornament could fit on the tree so we had to improvise, but overall I would say it was a great experiment and looks wonderful!